In preparation for Halloween, I designed this little home decoration- a tiny tealight holder. 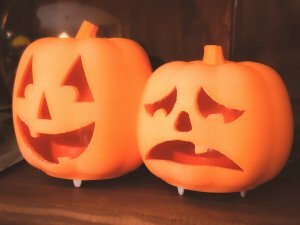 A cute pair of pumpkin Jack-O-Lanterns in the theme of comedy/tragedy theatrical masks. Designed to fit standard 38mm diameter LED flickering tealights (not recommended to use with real candles, obviously, as the plastic may melt when exposed to flame). You can find the link to download the models off of Thingiverse HERE. 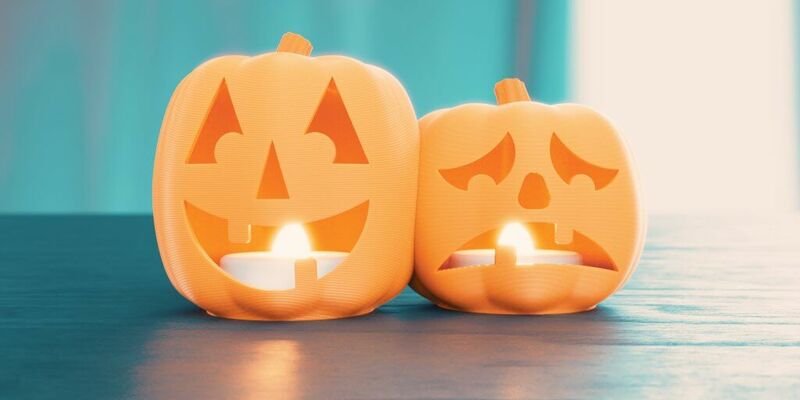 Included are STL files for: the combined tealight decoration, separate Happy and Sad pumpkins, and just the faces so you could boolean them into your own designs. Before modelling I made the decision to go with Blender3D rather than Fusion 360 for this project. Both are great free modelling softwares for Hobbyists, and Fusion 360 is an awesome piece of software for designing hardsurface and mechanical items, but seeing as this project was more organic modelling I went back to my traditional polygonal modelling roots. The first thing I do when opening up Blender is make sure that my scene is set to the correct units- we’re going to be 3D printing our model to scale in order to fit some real world LED flickering tealights, so we have to make sure our units are correct. 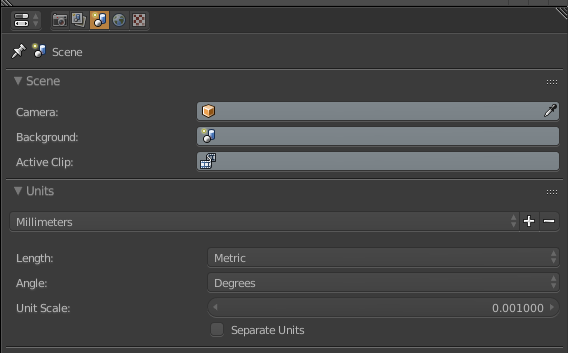 In the Scene settings I turn on Metric, and set my units to Millimetres. 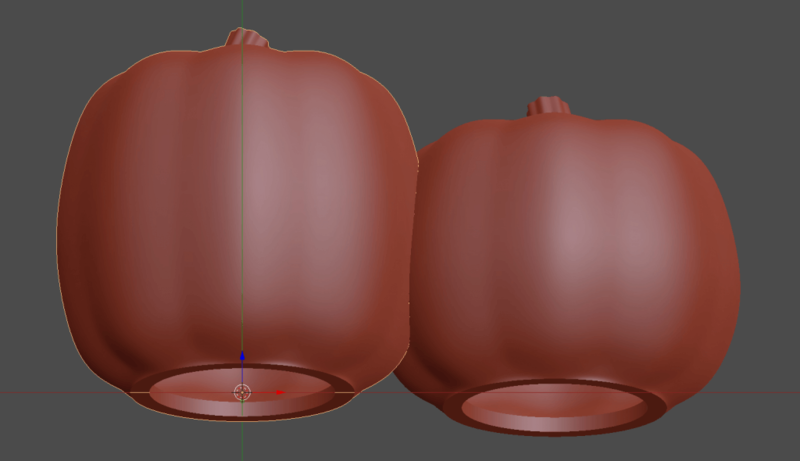 At this point, I start modelling the base of the pumpkin. I know that I want a symmetrical design for my pumpkin, and figure that 8 ridges will look best, as from the front that would mean a central ridge roughly for the nose and two more for the eyes. Because I’m modelling polygonally, the easiest way to achieve this is to create a 16 sided polygonal circle- I can then select every other edge and scale them in before applying Subdivision Surface smoothing (TurboSmooth for the 3DS Max folks) to achieve my pumpkin look. I can then duplicate my pumpkin, and edit that one to be more short and stout. The tall one will be my excited happy Jack-O-Lantern, the short one will be my downtrodden sad Jack-O-Lantern. 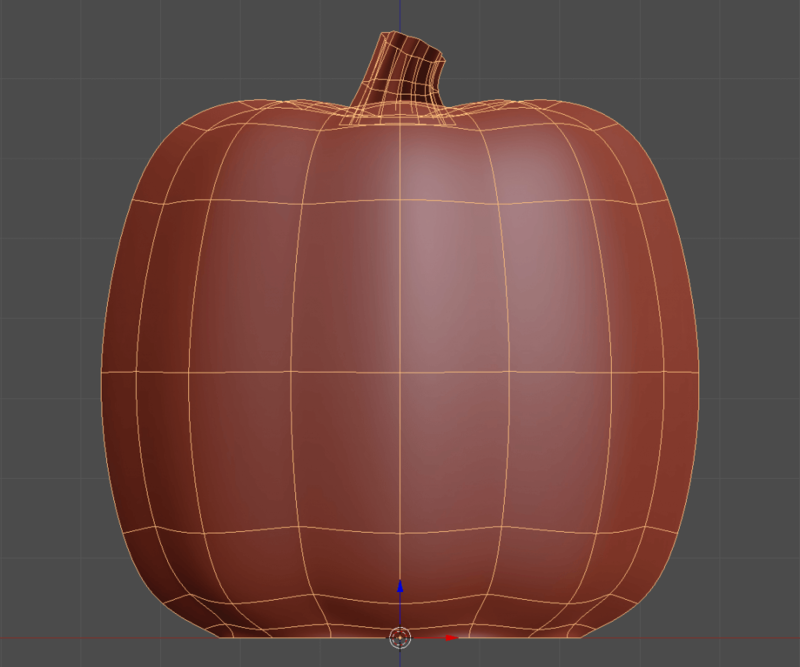 At this point I also add the Solidify modifier, and give my pumpkin a thickness of 3mm. Working this way allows me to easily change the shape of my design by just modifying the outer shell of my model, and then Blender will dynamically create the thickness of the inner walls of our 3D print based on that surface. 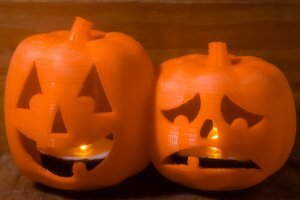 To create the faces of my pumpkins, I now open up Fusion 360. Fusion will allow me to draw the faces to scale in sketch mode using its powerful tools for dimensions and constraints like mirroring. 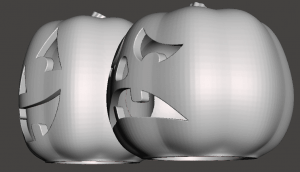 I sketch up my pumpkin’s faces using simple lines and 3 point arcs, then extrude the insides of these designs. 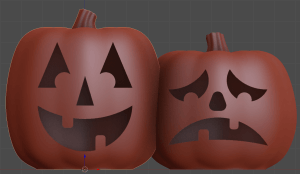 What I’m going to do is remove the faces with booleans, so the model I want is what is going to be removed from the inside of the outline- essentially the same shape as the chunk of pumpkin you would cut out of an actual Jack-O-Lantern. In Blender I then import the STL file, split apart the faces, and add the Boolean modifier set to ‘Difference’ on each pumpkin. Where possible, I prefer to leave modifiers not-applied. This makes the workflow non-destructive and dynamic. At this point, I have my pumpkins complete. If I want, I could go ahead and just print these pumpkins individually. However, I want to print these as a combined decoration- so I take the models into MeshMixer to do some boolean combining and remeshing. In the end I am left with a combined pair of pumpkins with a hole between them that lets the LED candle light leak through between them, which I found enhanced the randomness of the candle flicker and reduced the digital unnatural look of just one of these electronic tealights. At this point, I am ready to set up my print. I take my final combined STL file into Simplify3D and make sure that my dimensions are still correct. The model imports just fine, so now I need to set up my print process and supports. I’ve found that on my printer, reduced speeds of 40-50mm/s produce good results, and that I can go down to 0.15mm layer heights if I really want to get a fine detailed surface. Obviously if I want really fine surface details I would go from FDM printing to SLA and get very very thin layer heights, but for a model like this it really isn’t necessary. Layer heights of 0.15-0.25mm should provide ample smoothness to the curves on my surface. Because I have relatively thin walls on this model, I choose to go with 5 outer perimeters and top/bottom layers. This means that most of my model is solid plastic with no infill or voids, making it very strong. The only place that infill appears is in the thickest areas around the top of the pumpkins and in the stems. Before adding supports, at this point I like to actually preview my G-Code. Simplify3D’s preview mode allows you to actually go layer by layer or play in realtime exactly what your printer will be told to do- I find that going layer by layer is a great way to see what parts of your model really need support. As you’re going up the layers if a piece of your model suddenly starts printing in mid-air with no connection to any other material, that area is going to need support. And if your model has overhangs that mean any one layer is extended far beyond the support of the layer before it, that area is going to need support. My preview reveals that the top teeth of both pumpkins need support, the top of the happy pumpkin’s smile needs support, and the center of both pumpkins’ heads need support. With my supports added, I’m ready to print- my print estimate is around 10H, but Simplify3D doesn’t take into consideration the extra time it takes for the printer to accelerate and decelerate and change layer height- in my experience I’ve found that the actual print time is about 20-30% longer than predicted (and my final prints did come in closer to 12H). After printing, I took a sanding sponge I had to gently remove any of the “zits” and to smooth out the print lines just a bit. I was trying to avoid a ton of post-processing work on the model, but a quick polish really helped. I was quite pleased with the final product! In fact, I made two of them! Once again, the files for this project are available on Thingiverse if you’d like to print your own. My name is Jeffrey Hepburn- I'm a filmmaker, photographer, and digital artist. ​ As a digital artist I've been working with Blender for over 7 years, and I specialise in hard-surface modelling, PBR texturing, and lighting.Locally I've worked as a photographer, filmmaker, and technical supervisor for many of the local festivals, political campaigns, and productions. I'm also one of the founding board members of the Orlando Filmmaker's Coalition (OFC), a registered non-profit dedicated to educating and providing a space for the local arts community to network and create movies.Recently I've been making the transition into prop making and 3D printing as well- taking my digital creations and bringing them to life.